The entire family is dedicated to Tae Kwon Do and its many benefits. In a short period of time, it has had a major impact on the Meyer family. Take a closer look at the Meyer family’s story. How long have you been doing Tae Kwon Do? Why did you start? My Mom and Papa wanted me to take class when I was younger, but it looked scary to me and I didn’t want to do it. One time when Master Shim’s WCTKD came to my mom’s school, she brought me up there to take class with the Braelinn kids and I loved it. That’s when I decided I wanted to take Tae Kwon Do. I started taking class a few months later. I have been taking Tae Kwon Do now for almost a year and a half. What has Tae Kwon Do done for your confidence? I am very proud of how much I’ve learned in Tae Kwon Do. I’m the highest belt in my family! Why do you like Tae Kwon Do? Why would you tell another kid that it is fun to do? I like going to class. I look forward to seeing Master Kim and my friends at Tae Kwon Do. Master Kim is a great teacher, and he makes class lots of fun. They also do lots of fun things for us – like the Health-kick! I love getting to dress up in costume and break all those boards! 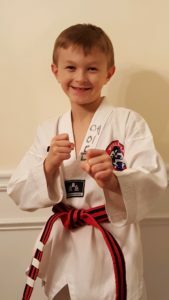 Tell me about some of your Tae Kwon Do accomplishments and things you have achieved? Last spring, I went to Master Shim’s Tournament and I competed in Forms and Board Breaking. I got 1st place in Forms and 3rd place in Board Breaking. How long have you been doing Tae Kwon Do? Why did you start? I have been taking Tae Kwon Do for one year. My brother and Dad started taking Tae Kwon Do first, and for a while I didn’t think I wanted to do it – I was nervous. But then Master Kim encouraged me to take class in December for family month. I gave it a try, and realized it was a lot of fun. After that I made the decision to keep taking class. 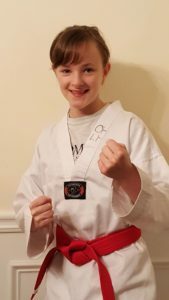 Did you have any problems/issues that Tae Kwon Do helped you overcome? Yes – my right leg is weaker than my left leg. Doing Tae Kwon Do has helped my right leg to get stronger. It’s also helped to improve my balance and coordination. It happened. Your child was enjoying a perfectly normal day of fun outside. Your child suddenly cries out in pain – she’s been stung. Redness develops at the site of the sting, and it starts to swell. She is having an allergic reaction. The body’s response to a bee sting can vary from mild to severe. The most dangerous response can include difficulty breathing, swelling of the throat and tongue, or even loss of consciousness. How do you protect your child from having this experience? Make your outdoor environment as safe as possible. In this instance, that means exercise caution when drinking sweet beverages outside. Bees are attracted to the sweetness and can crawl in straws or cans. Also, make sure trash cans are tightly covered, and pick up fallen food. Both can attract bugs and bees. Pay attention to your outdoor attire. Open-toed shoes and excessive loose clothing can provide places for bees to hide. Bright colors and floral prints attract bees, so that is also something to consider. One final preventive tip – if you find a bee’s nest or hive near your house, have a professional come take care of it. The last thing you want to do is anger its inhabitants and cause them to attack.